BREAKING: Charges Dropped Against Jussie Smollett - Joe.My.God. 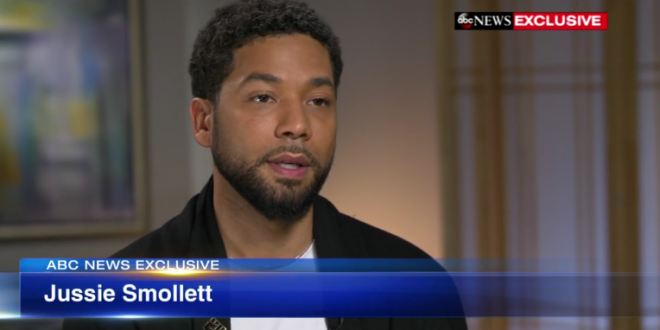 Mr. Smollett, who had been indicted on 16 counts of disorderly conduct, was removed from the rest of the current season of “Empire.” It is unclear what Fox, the network which airs “Empire,” will do now; it did not immediately respond to a request for comment. It is also unclear why Cook County prosecutors dropped the charges. A spokeswoman for the State’s Attorney’s Office did not immediately respond to a request for comment, and a spokesman for the Chicago Police Department referred questions to the State’s Attorney. The actor has reached a deferred prosecution deal with prosecutors that wipes out the charges against him. The $10,000 posted for Smollett’s bond will be turned over to the City of Chicago Law Department. “After reviewing all of the facts and circumstances of the case, including Mr. Smollet’s volunteer service in the community and agreement to forfeit his bond to the City of Chicago, we believe this outcome is a just disposition and appropriate resolution to this case,” the Cook County state’s attorney’s office said in statement. BREAKING: Attorneys for “Empire” actor Jussie Smollett say charges alleging he lied to police about attack have been dropped.